Who’s Behind the Attempted Coup in Turkey? Mr Bass, you guys have a long history of removing, or attempting to remove, leaders of sovereign nations whose policies and activities don’t meet with your approval. So don’t come the raw prawn with us! Dear readers, you may think the following notes on falling oil prices have nothing to do with a failed military coup in Turkey, but don’t be too hasty. I read an interesting article in the Daily Telegraph a week or so ago entitled Texas shale oil has fought Saudi Arabia to a standstill. Quoting a number of sources, the article was lauding the success of the shale oil industry in reducing the costs of the fracking process, enabling the United States to meet its own needs and drive down the global price of oil, thereby dealing a severe blow to the OPEC countries who, as we all know, are Muslim Arabs. The headline and much of the text focuses on Saudi Arabia and the damage the US is inflicting on the Saudi economy with its industrial might. The Saudis and their Gulf allies have decided not to sacrifice their own market share to restore the price. The process requires huge amounts of water, which inevitably becomes contaminated, even if it does return to the surface, and a lot of it doesn’t. There seems to be some secrecy in the industry about chemicals used in the process. Large areas of land are rendered unsuitable for other uses, including wildlife. There is enormous noise pollution, both from the process itself and from convoys of trucks bringing sand and other necessary materials to the site. There is also a danger of increased seismic activity resulting in earthquakes. For these reasons, the extraction of oil by hydraulic fracturing (fracking) is under international scrutiny, and has been banned outright in some countries. Where do you slot in? According to a source quoted in that Telegraph article, much of the finance for the fracking industry is being supplied by Wall Street private equity groups such as the Blackstone and Carlyle Groups. Of course wise investment is an important motive for those businesses, but some might argue that equally important is the need to keep the world safe for capitalism. Daniel Rubenstein, one of Carlyle’s founders is identified in his Wikipedia biography as “financier and philanthropist”. He is also credited with having foreseen, in 2006, that private equity “activity” was about to crash – which it did indeed – but predicted in 2008 that the lean period would soon be over and he and his cronies would be back sucking the world dry more profitably than before. Three big cheers for philanthropy, people! Do I sound sceptical? Apart from the involvement of Mr Rubenstein and his “philanthropic” ilk, I have other reasons. My primary concern is I do not believe Saudi Arabia is the main target of US strategy here, nor is a desire to be self-sufficient in oil production for its own sake, and I’ll tell you why. Saudi Arabia is a firm ally of the United States, and the single biggest customer of the US arms industry. What do they do with all that military hardware, given that they don’t seem to be directly involved in any actual wars, to the best of my knowledge. Another source in that Telegraph article asserts that the Saudis are proxy suppliers of military hardware to Egypt and “an opaque nexus of clients in the Saudi sphere.” Whose proxy? No prizes for guessing that one! Furthermore Saudi Arabia has ample foreign reserves and its oil is very cheap to extract. It is well placed to withstand a long siege of low oil prices without seriously affecting the bloated lifestyle of its citizens. OPEC, however, is not just composed of Middle Eastern Arabs and Muslims. Venezuela, with the world’s second largest oil reserves, was one of the five founding members of OPEC in 1960. Also in the group are Ecuador, Indonesia and several African countries with low per capita incomes: Libya, Algeria, Nigeria, Gabon and Angola. Do you see any countries in that list that Wall Street financiers might not love? Ecuador and Venezuela have been at the forefront of South American Bolivarian socialist progress for two decades. Rafael Correa and his neighbour Hugo Chavez began the process of nationalising their countries’ resources and using them to raise living standards for all their people, and Chavez’s successor Nicolas Maduro has continued on the same track. When the fracking’s over . . . In 2002 a military coup in Venezuela succeeded in overthrowing President Chavez, but after huge demonstrations of public support, the generals handed the reins of government back 47 hours later. According to Wikipedia, “In December 2004, The New York Times reported on the release of newly declassified intelligence documents that showed that the CIA and Bush administration officials had advance knowledge of an imminent plot to oust President Chavez, although the same documents do not indicate the United States supported the plot.” Well, they wouldn’t, would they? Not a scrap of evidence, as the US Ambassador to Turkey would say. However, those Wall St financiers don’t give up easily, and they don’t have to win elections to stay in power. There is more than one way to bring down a government you don’t like. Ask Egypt’s Mohammed Morsi. I came across an article in Global Research last month entitled US-Led Economic War, Not Socialism, is Tearing Venezuela Apart. The writer, Caleb T Maupin, argues, “The political and economic crisis facing Venezuela is being endlessly pointed to as proof of the superiority of the free market . . . In reality, millions of Venezuelans have seen their living conditions vastly improved through the Bolivarian process. The problems plaguing the Venezuelan economy are not due to some inherent fault in socialism, but to artificially low oil prices and sabotage by forces hostile to the revolution . . . The goal is to weaken these opponents of Wall Street, London, and Tel Aviv, whose economies are centered around oil and natural gas exports”. Who benefits from this economic war? No prizes for guessing that one either. Who suffers? Well, that’s pretty obvious too. The people of Venezuela and Ecuador in the short term, of course – but more so in the long term if the populist economic reform process can be derailed. The people of those African oil-rich countries, Libya, Algeria, Nigeria, Gabon and Angola, certainly, if the multi-national oil companies can retain their control of production. But there are others too, who receive even less publicity: the millions of migrant labourers from India and other poor countries who have been working in Saudi Arabia and other wealthy states in the region. A news report ten days ago revealed that the Indian government had come to the rescue of more than ten thousand of their citizens starving in Saudi Arabia. 16,000 kg of food was distributed by the consulate in Jeddah to penniless workers who had lost their jobs and not been paid. The report claimed that there are more than three million Indians living and working in Saudi Arabia, and more than 800,000 in Kuwait, many of whom have not been paid for months after factories closed down, and employers are refusing to feed them. The Indian government is taking steps to evacuate as many as possible. Wink, wink, nudge, nudge . . . Destroying a country’s economy is slower, but leaves less obvious dirt on the hands of the perpetrators, and has the additional advantage of inciting the people of the targeted country to oust the government themselves. It is clear that the United States, or at least the small amoral power group who control it, do not care if they irreparably destroy their country’s natural environment, nor how many helpless, innocent people at home and abroad suffer for their greed. The US Ambassador to Turkey may be deeply hurt – but I doubt it. Any moisture you see in his eyes will surely be crocodile tears. This entry was posted in CIA, democracy, Economics, environmental awareness, Hugo Chavez, military coup, National sovereignty, Rafael Correa, US militarism, Wall St and tagged CIA, US imperialism, US politics. Bookmark the permalink. They use onions in Hollywood, not Crocodile tears. Funny you didn’t mention the location and ownership of the Carlyle Group. Yes, you’re right, that’s very interesting too. In fact there were several ideas in that post I’d like to explore further, but I didn’t want to stray too far from the main topic. If you’ve got some good info, though, I’ll be happy if you post it here. 🙂 A compassionate smile for someone who doesn’t want to write about politics. The (worldwide) Hegemony’s dark forces refuse to allow the People to heal and live in prosperity. Is it true, that “a picture is worth a thousand words”? What Is That Encircling The People’s Habitat? Kinda looks like scorpion claws, or is it the symbol for the Roman Worldwide Empire? Me? Write about politics? 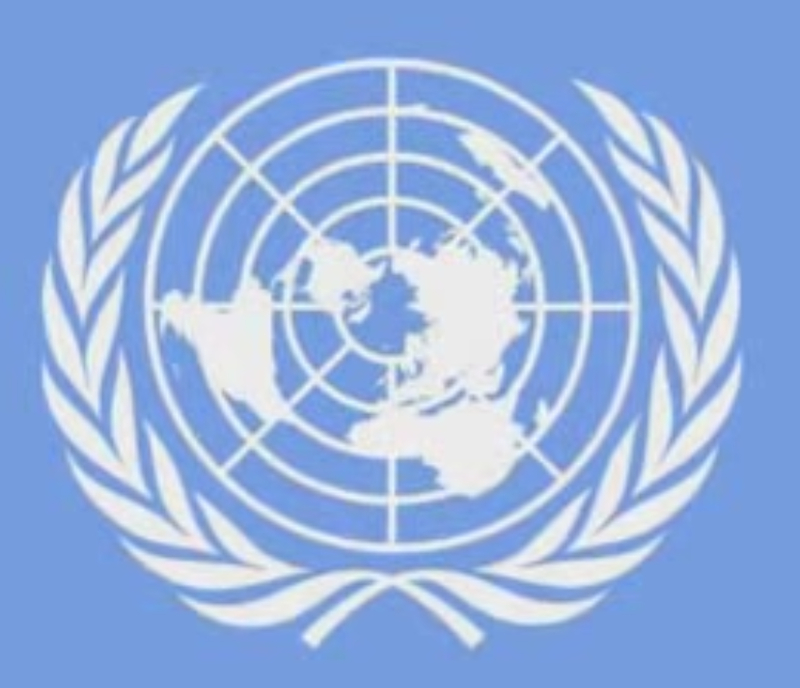 I hadn’t looked at the UN symbol that way. And where is New Zealand? Is it that little blot upper centre? I looked at the U.N. Flag so much I had nightmare-dreams about it. Don’t click that link unless you are willing to jump into the deepest depths of conspiracy research that is so fringe that most “educated” individuals think that is “crazy” talk. Is the Truth hidden in plain sight, on the U.N. Flag? What would the worldwide empire territorial boundary look like? I ask myself, isn’t this very similar to a scope’s precision sight and aim? Is the People’s habitat targeted? Is that the empire’s territorial boundary? Wouldn’t a worldwide empire have a worldwide monetary system? Oh my, there is a worldwide monetary system! Wasn’t the Bretton Woods Agreement with its Financial Stability Board (FSB) and IMF’s basket of reserve currencies for SDRs, and the central banks’ controlling worldwide financial transactions too much of a coincidence? But, isn’t a worldwide military a requirement for a worldwide empire? Oh my, the U.S./NATO military assets are worldwide, aren’t they? Is the Truth hidden in plain sight? *Note the worldwide collaborative efforts of the Inter Agency Group (IAG) on economic and financial matters because the IAG consist of the BIS, ECB, Eurostat, IMF, OECD, U.N., World Bank, and the FSB. Precisely the type of international cooperation required to manage a worldwide monetary system! Along with the above organizations the G20 Finance Ministers and Central Bank Governors (FMCBG) are working together to implement what they call the Data Gaps Initiative (DGI) that will close the data gaps identified from the 2007-2008 global financial crisis. Isn’t, by definition, the ability to make worldwide decisions and policies a worldwide empire? Who else other than a worldwide empire has the power to make international decisions and policies? Yikes, Ron! You’re scaring me! Great article, Alan. Thanks for taking the time to do this. I value your opinion, Dr Bramhall. Thanks for the feedback. I think you meant to say the Worldwide Hegemony, is scaring you. The truth seeker must face that fear. Knowledge of the truth makes a man unfit to be a slave. With the knowledge of truth the People on earth will be free. The truth revealed may parallel the Great Wizard of Oz. You can seek and find TRUTH. You have great innate talents for joyful creativity. The elite globalists are not all powerful. Thanks for the encouragement, Ron. We’re trying to let our little light shine! Keep up the good work!